What is Mid Point Theorem? Geometry is one of the most important branches of mathematics that deals with figures, shapes based on their properties. One of the popular theorems in Geometry based on the properties of the triangle is Mid-Point Theorem. 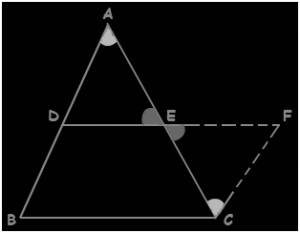 Based on the Theorem, in a triangle, the line segment that connects the midpoints of two sides of the triangle will be parallel to the third side and half of it. Take the two mid point of any two sides of a triangle and join them through line segment. Here, the line segment will be parallel to the remaining side and half of it as well. This is called the mid-point theorem in Geometry. As per the coordinate Geometry, the mid point of the line segment would be the average of endpoints. If you know the x and y coordinates then apply the mid-point theorem to calculate the final values. Further, this theorem is also applicable in Calculus and Algebra too. 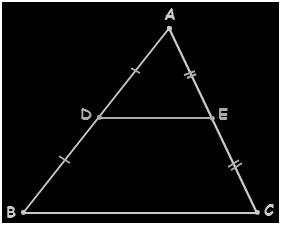 Based on the image given above, the triangle ABC is adjoined by two mid points D and E. Then DE should be parallel to BC and measured half of it as well because mid-points are calculated for two other sides i.e. AB and AC. DE = (1/2 * BC). The mid-point theorem is also possible to solve through triangles. The line segment of the a side for two parallel axes begins at the endpoints then the final result would be two similar triangles. The relation of these triangles would be the Mid-point Theorem. This is also possible to calculate the converse of a theorem in mathematics and it is equally important for students to learn properly. Based on the converse of a mid-point theorem – when a line segment is drawn passing through mid-points of any single side of a triangle and it is parallel to another side then line segment should bisect the third side too. The mid-point formula works similar when you are trying to find out the middle value of two given points or its average. You just have to make sure that x coordinates are added with x and y coordinated are added to y.